Directed by rising star Jamal Hill; just after the 1st single release of his most anticipated album “Dreams worth more than Money," the unrated version of the film Streets breaks with Redbox nationwide. Meek Mill stars in this high energy drama with a wowing performance. In this high-energy suspense filled drama, Meek Mill, makes his debut acting performance as a high profile rapper in Philadelphia who is caught up in a web of cover-up deception and lies. Meek Mill, is an American rapper from Philadelphia, Pennsylvania. Best known fo his affiliation with Rap and Business Supertsar Rick Ross and his Label Maybach Music Group also known as MMG. Meek Mills has performed sold out shows for his fans round the globe. Jamal Hill has always been fascinated with all genres of art, particularly film and music. Hill and his mother produced Hill’s first film, “Money Power Respect”. The film won at the Philly Underground Film and soon gained national attention. Soon after the film’s release Charlie Mack, a Will Smith and Overbrook Films associate, reached out to Hill regarding his film work. Hill has been with the Overbrook camp ever since, working on block buster films such as I Am Legend, Hancock, Iron Man and directing Lady Gaga's "The Fame", a short concert movie. 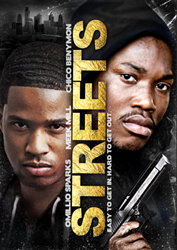 In 2010, Hill returned to Philly to direct the feature film "Streets" starring Meek Mill. Urban Home Entertainment is a leader in home entertainment. They are a boutique film company that specializes in stand-up comedy, urban, Latin and faith-based films. The company is headed by father son team Barrett and Trae Dungy. UHE has been independently own and operated in Atlanta, GA since 2001. Their content is carried in over 2400 mass retailers, e-tailers and digital outlets across the globe. UHE is also the home to Zoe Saldana’s ‘Curse of Father Cardona’, Megan Good’s ‘Miles From Home’, T.D. Jakes’ ‘The Scroll’, and the film ‘Streets’ that features multi-platinum selling artist Meek Mills.